With this exclusive offer, Rewarding Times have teamed up with Click&Go to offer you a stunning Boutique Design Hotel experience in Rome for only €349pp.This great deal includes return flights, return transfers to your hotel in Rome and 3 nights in a gorgeous centrally located hotel. At Click&Go, their promise is simple, to help you land the perfect getaway so that you can sit back, relax & let your holiday just click into place. Irish owned, secure & reliable, Click&Go offer a great range of carefully selected destinations for sun, city & cruise holidays on their website. They also have a team of expert holiday helpers on hand to assist with your booking or provide any advice you need. This Superior design hotel is located in the city centre of Rome in the l'Esquilino district, which is one of the oldest areas in Rome and full of Art Nouveau architecture, long boulevards, ancient arches and alleys. It is just a 10 minute walk from Termini station and Metro stops for Line A & Line B are close by. Presented with the Certificate of Excellence Award from Tripadvisor this hotel has been highly rated and recommended. The property prides itself with the high level of service offered by all its staff, and the hotel reception is open 24 hours. A delicious breakfast buffet awaits in the morning with both sweet and savoury breakfast options. All 77 rooms are modern and contemporary in design. Classic rooms are equipped with minibar, air conditioning, flatscreen-TV, kettle, safe, modern bathroom and also offer free WIFI. 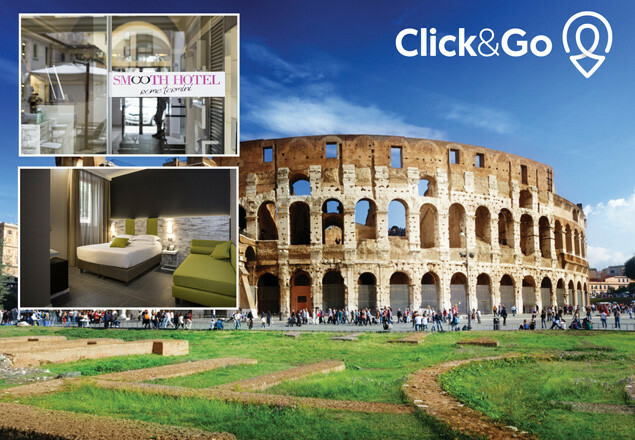 Click&Go can only book your Rome City Break after you have received your Voucher. Once confirmed by Click&Go full cancellation charge applies.